Carved from one piece of quality foam. Supports the neck and cradles the head. Tranquillow’s gentle contour features one side slightly higher than the opposite side, for individual support and comfort for either side or back sleeping, and its shape encourages better posture during sleep. Designed to help minimise neck and shoulder stress and muscle stiffness in both ‘new’ and ‘old’ injuries. May assist asthma sufferers and others who require clear breathing patterns. Aids breathing patterns – may help alleviate snoring! (as side sleeping is beneficial for enhancing clearer breathing by opening the airway). ‘No bounce’ non-moulded construction provides desired nestling effect for neck and head, ensures comfort. Tranquillow comes in five sizes and densities to ensure that the support needs of all individuals regardless of their size or sleeping position can be met. Children’s: For the tender years 3-7. Suits Naturelle Pillow Protector in Small Size. Standard: available in ‘soft’ and ‘deluxe’ densities. For average framed persons, and side sleepers. Suits Naturelle Pillow Protector in Large Size. Queen: available in deluxe foam. Suits broader-framed (above average) persons who sleep on their side. Suits Naturelle Pillow Protector in a Large Size. King: available in deluxe foam. broad-framed side sleepers. Suits Naturelle Pillow Protector in a Large Size. Carved from one piece of quality foam. 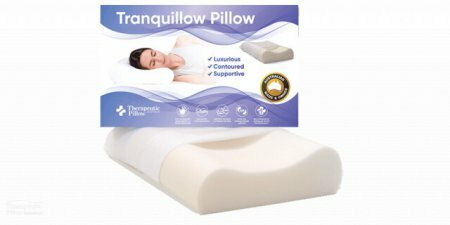 Tranquillow supports the neck and cradles the head. The contour of the pillow features one side slightly higher than the other to provide user options and ensure that personal support and comfort needs can be met. Covered in removable cotton cover. Ideal for average frame adults who have a preference for side sleeping, but is also suitable for back-sleeping. Available in Small, Standard, Queen and King sizes and in a variety of densities. Our original therapeutic contoured neck pillow, carved from non-allergenic quality foams in different densities and softness. Specifically designed to support the neck and cradle the head. Tranquillow has been designed to encourage better position and posture during sleep by maintaining the spine’s natural alignment. 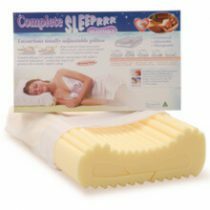 We recomend the use of the Naturelle Pillow Protectors with all the Tranquillow range to both better look after you and your pillow. Please see below for appropriate protector sizing for your pillow.